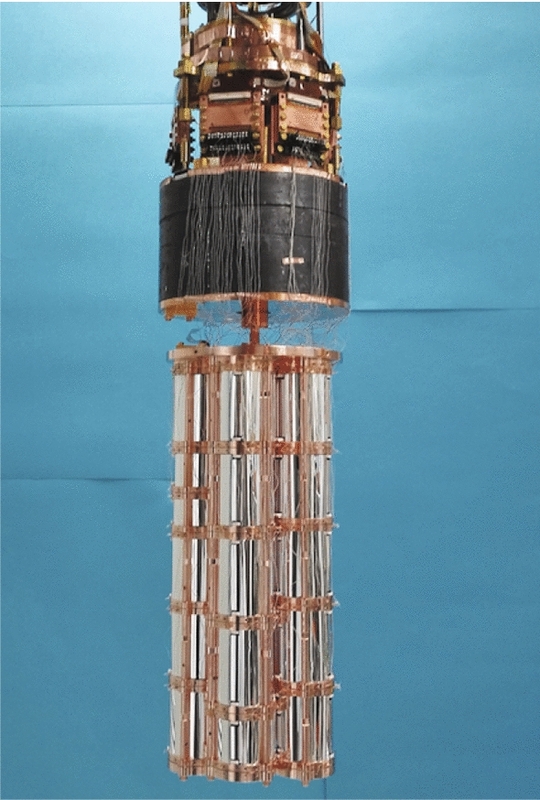 In 2018, IRFU is participating in a publication CUPID-0: the first array of enriched scintillating bolometers for 0νββ decay investigations which reviews a first matrix of bolometers installed in the Gran Sasso laboratory in Italy, with the objective of tracking the double beta decay without neutrino emission (0νββ) that will reveal the nature of neutrinos. This publication describes the integration of the detectors, their testing and commissioning for a first data collection that began in 2017 with the participation of IRFU and IN2P3 researchers at various stages. The test results show a very good response of the electronics and cryogenic systems. The mean value in energy resolution proves the unmatched efficiency of this technique for measuring radioactivity, which makes it possible to dissociate beta decay from alpha decay, a source of background in this research. The CUPID-0 detector with 26 scintillating bolometers organized in 5 towers. 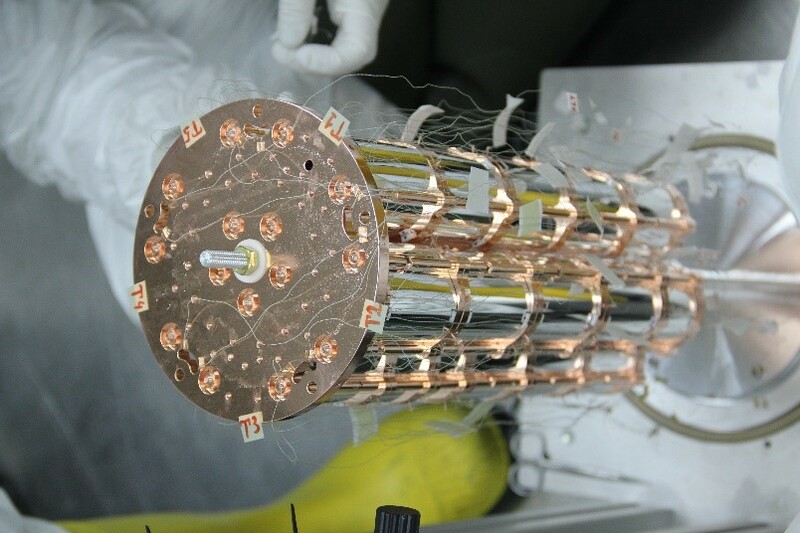 CUPID-0 seeks to detect decay without neutrino and develops a series of scintillating bolometers for this purpose. The challenge of the experiment is to increase the experimental sensitivity in the region of interest while reducing the dominant background associated with alpha decay. 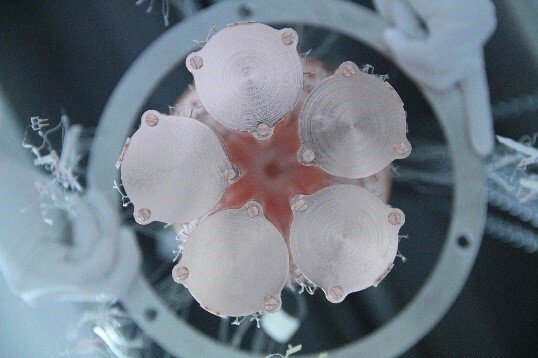 To do this, the experiment uses ZnSe crystals, to allow detection with a better background by nearly an order of magnitude compared to CUORE, the previous experiment. The demonstrator contains 26 ZnSe crystals, 24 of which are 95% enriched with 82Se and two natural (about 8% of 82Se). On the left, a scintillating bolometer of the CUPID detector and on the right, a real module during the integration in tower inside the clean room. 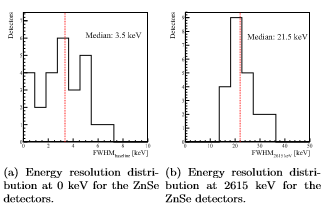 When a nuclear event occurs, the ZnSe crystal undergoes an increase in heat. This tiny increase is detected by temperature sensors. In addition to the temperature change, a scintillation light is emitted by the crystal. This radiation is collected by the light detector. The advantage of this dual detection is the discrimination of decay types. Indeed, in previous experiments, a large part of the background came from alpha decay (see previous highlight). However, these do not have the same combination of temperature and light signal increase as the signal and are therefore separable from beta decay. The project's scintillating bolometers are periodically irradiated with a 232Th gamma source (Thorium) for calibration. The 5 towers of the CUPID-0 detector. The main innovation of CUPID-0 compared to CUORE is the use of scintillating bolometers, which combine light detectors and temperature sensors. IRFU teams participated in the manufacture of the light detectors, the integration in the clean room and the installation in the laboratory's premises in Italy. The installation of the CUPID-0 detector was completed in late 2016-early 2017 and cooling and initial diagnostics began in February 2017. The results of the energy distribution of ZnSe. The first tests with the Thorium source show a very good response of the detectors. Indeed, the energy resolution of the detectors reveals that cryogenic systems and electronics operate at a level at the forefront of current research. The very good ability to discriminate events promises interesting future studies. This is made possible by the excellent performance of the light detectors and their reproducibility.